I think I've jacked my own thread............. yup !!! officially jacked !!! You get your new rifle yet??? Maybe this will get us back on track; You are correct, chambered I went back and looked I was allowing 1.00" for the bullet length for the Rob. and it was still loading in a 3" mag, I was rounding up so as not to bind the follower. Those older softnoses are harder to measure then say a f.m.j. or nylon tipped projectile. My mistake. Usually the A.I. 's neck length exceeds the parent cartridge. So I would imagine this would push it over .280" I have always liked long necks. In more ways then two. Reminiscent of the .257 Bighorn. Then you should really like the 6mm Remington too !!! kinda, just never caught that bug, I played with 6-284 a bit and the .243 the 6's are almost too small for me, I can't explain it I have always liked the .25's even though there isn't that much difference. As much as I like the 6mm Remmy you'd think I'd be more interested in the Roberts !!! 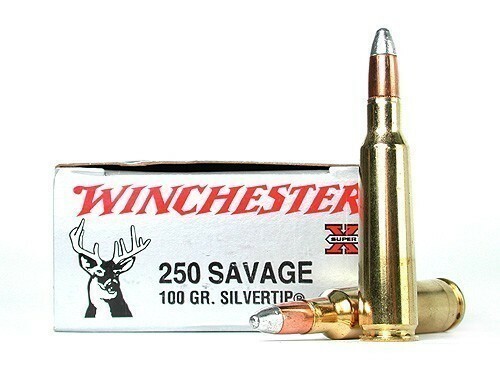 There's just something about that little .250..............I think it's efficiency has a lot to do with it !!! chambered, what is your definition of efficiency? When I think of efficiency, I think of bullet BC or grains of powder per velocity. I sense a little fishing going on......... but I agree with you !!! Going back to the original object of this thread :-p I thought that the only difference between the 250 and 250AI was in the angle of the shoulder. Shouldn't case length be the same with just the shoulder starting more forward on the case? Now here is an associated question: Pushing the shoulder forward gives a small increase in powder capacity - the only reason for this procedure. How does this affect maximum charges. Why is a rifle that has been rechambered for the AI cartridge safe to fire at a higher maximum charge of powder? Is it because the larger case area means more of the chamber surface is bearing the increased load stresses? Mac, here are pictures of a standard .250 and a improved version !!! As you can see the body taper is eliminated and shoulder angle is changed, this is where the increased capacity comes from. Ah, learned something new. Any day you learn something is a good day. Course at my age I hope I remember it tomorrow Thanks. I use to own a M700 rechambered to 30/06 AI, 18 years ago when I bought this rifle, I had it rechambered for the AI. I did see modest improvement of around 100fps over the original 30/06 case. The Biggest advantage was it could also shoot factory 30/06, after shooting the cases were formed to 30/06 AI, so this was like a wildcat cartridge back then and you had to hand load with /06 AI dies. But the best part was case longevity, it seems with the sharper shoulder angle, the cases were not stretching like the parent /06 was, and if any, all I had to do was neck size. I haven't found .25-cal bullets to have slick BCs. For that I'd use 6.5 and 7mm. I'd have to study the loading tables some more, but it doesn't look like .25-cal cases are anymore efficient than others.